In ‘Game Night‘, a group of friends who meet regularly for game nights find themselves trying to solve a murder mystery. Comedy with an amazing twist! 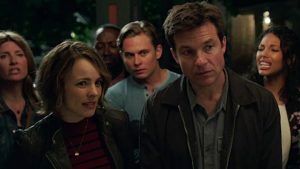 Jason Bateman and Rachel McAdams star as Max and Annie, whose weekly couples game night gets kicked up a notch when Max’s charismatic brother, Brooks (Chandler), arranges a murder mystery party, complete with fake thugs and faux federal agents. So when Brooks gets kidnapped, it’s all part of the game – right? But as the six uber-competitive gamers set out to solve the case and win, they begin to discover that neither this game – nor Brooks – are what they seem to be. Over the course of one chaotic night, the friends find themselves increasingly in over their heads as each twist leads to another unexpected turn. With no rules, no points, and no idea who all the players are, this could turn out to be the most fun they’ve ever had… or game over. HIGHLY RECOMMEND, BEST SO FAR IN 2018!! Comedy ‘Game Night’ Gets Writer/Director Pair Who Brought Us ‘Vacation’!!! This entry was posted on Friday, February 23rd, 2018 at 12:17 pm	and is filed under Film, News. You can follow any responses to this entry through the RSS 2.0 feed. You can skip to the end and leave a response. Pinging is currently not allowed. « Video Film Review: ‘Una Mujer Fantastica aka A Fantastic Woman’! !